Euro decided to move according to alternative scenario. 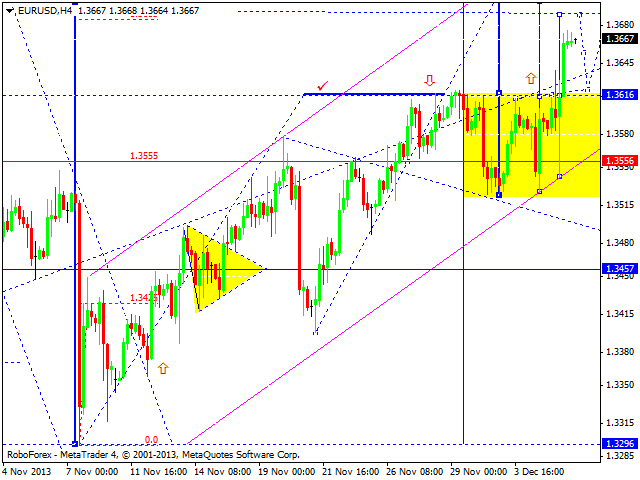 We think, today price may continue extending the fifth wave with target at 1.3712. Considering that this extension comes near level of 1.3556, pair may reach above-mentioned target at once, or after falling down towards 1.3620 first. 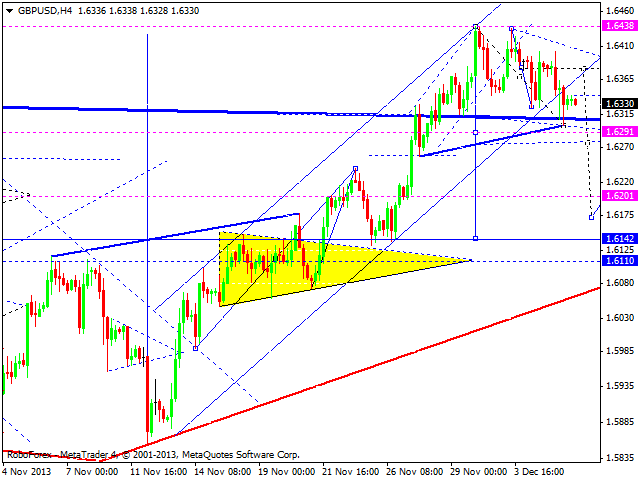 We should note, that such extension may result in new correction to return to 1.3460. Pound completed the first structure of its descending wave. We think, today price may grow up to test level of 1.6380 and then start forming the third wave to continue correction. Predicted local target is at 1.6200. 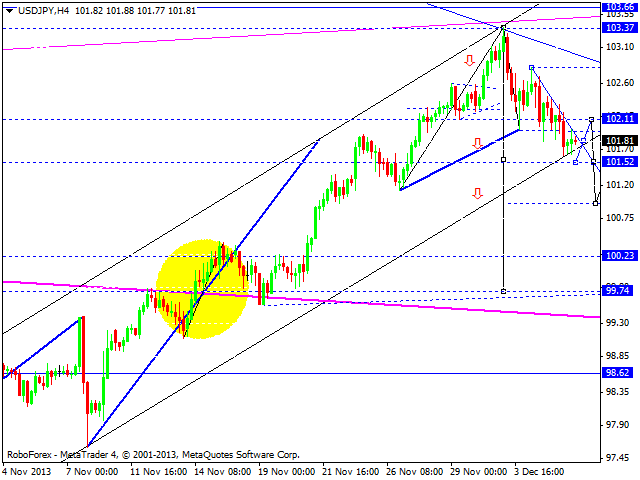 After pair completes continuation pattern, we will specify the target. Franc continues moving downwards according to our main scenario. We think, today price may continue falling down to reach 0.8900 and then form ascending structure towards 0.9076. Both these structures, this descending and future ascending one, may be considered as part of “diamond” pattern from daily chart, which is being formed at minimum of the first five-wave structure of the third descending wave. As a rule, such structures mean that market is going to continue falling down. Target of the third descending wave is at 0.8300. Thus, pair may rebound from level of 0.9076 and continue moving downwards to break minimum of this structure. Yen is still forming third descending wave; market has reached predicted target and may continue falling down. We think, today price may reach level of 101.52, break ascending channel and then grow up to reach 102.11. Later, in our opinion, pair may reach new minimum once again and from continuation pattern to continue falling down. Target is at 100.25. 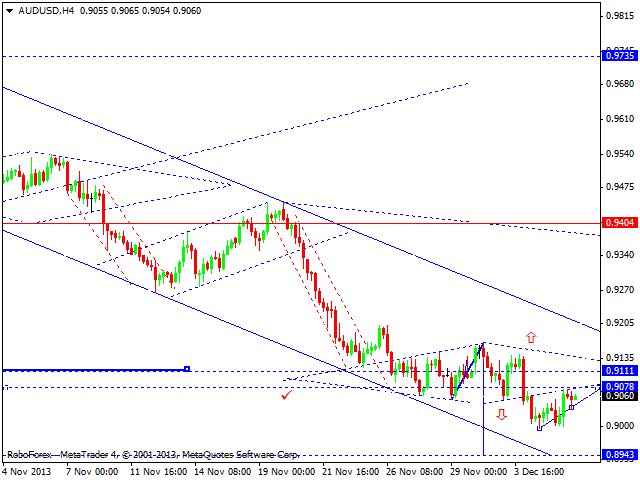 Australian Dollar is trying to form ascending structure with target at 0.9078. 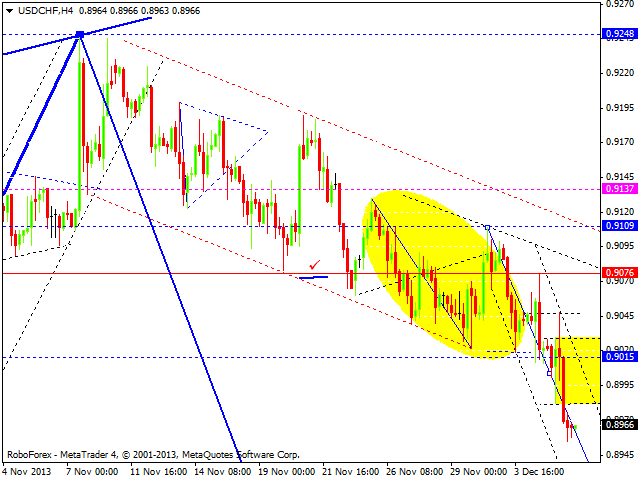 We think, today price may reach this target and then continue falling down towards 0.8945. Later, in our opinion, pair may consolidate for a while and then continue moving inside descending trend. 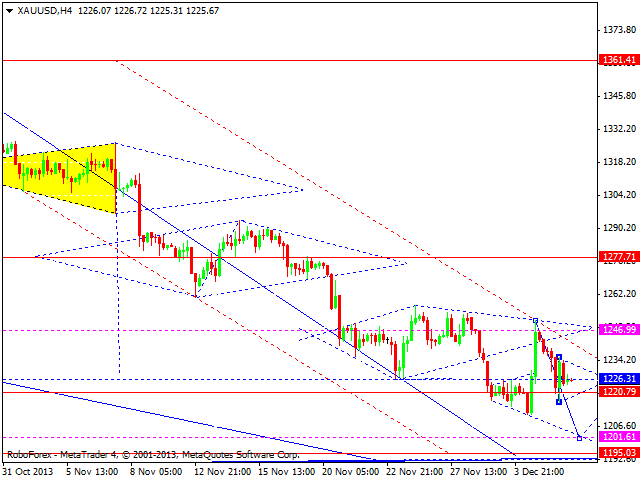 Gold continues forming descending wave with target at 1201; right now market is in the middle of this wave. We think, today price may consolidate near 1226 and then continue falling down towards above-mentioned target. Later, in our opinion, instrument may return to 1226 to test it from below and then start new descending movement to reach level of 1195.